Two things need to be clarified at first: 1. When eating in Italy, you will hardly be looking for "Spaghetti Bolognese" in a restaurant. In real italian culinary world there is only tagliatelle, gnocchetti or similar kind of pasta which can be made with ragù - rich (usually) meaty sauce cooked for hours. 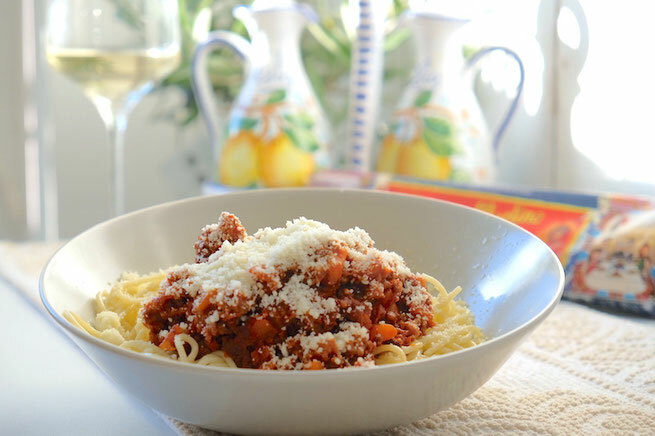 Ragù alla Bolognese is sort of ragù sauce where back in 1700s in Bologna, tomatoes were added to ragù sauce. So once you will travel to Italy and would love to eat your plate of Spaghetti Bolognese, ask for tagliatelle al ragù (alla bolognese) instead. 2.You will not find place serving SPAGHETTI with ragù in Italy. Ragù is rather rich chunky sauce which goes best with wide shaped pasta such as tortelloni or tagliatelle. But enough of talking, let's cook! Obviously, I love to break the rules, so I made my "Pasta all ragù" with Spaghetti once. Heat the lard (or olive oil) in your sauté pan, and add finely chopped onions, carrots and celery. Cook for at least 5 minutes over a medium head. When nice and soft, add the mince meat. Stir well and let to cook until the meat has changed its colour (for about 5 minutes). Add the splash of red wine (about 200ml) stir in and let the alcohol to cook away. After you did this, pour in the tomato puree and can of chopped tomatoes. Add the stock and let to simmer for about 2,5hrs, stirring ocassionaly. If you cannot wait, you can shorten the cooking time to 1,5hrs. After this time, your ragù alla bolognese will be nice and thick. Add some pepper and salt to season. When your meat sauce is ready to serve, boil about 2,5l of salty water in your large pan. Put the tagliatelle or fettuccine inside and cook until they are soft, but not overcooked (al dente). Once the pasta is cooked, drain and add it to the ragù. Mix well. Plate up your tagliatelle with ragù nicely, into a pasta bowl. Then grate some pecorino or parmigiano cheese over the top. 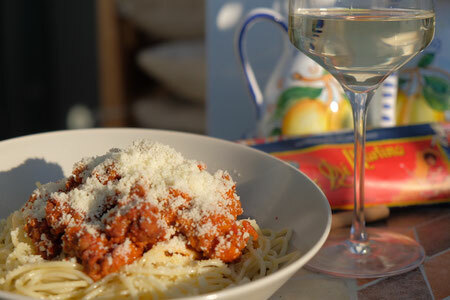 Pour some nice red tuscan wine into your glass and serve!